Backbends are the ultimate expression of openness and gratitude to the long, sunny summer days. Stretching wide across the chest area, and rippling through the whole length of the back, is very liberating and loosens built up tension in the spine. Backbends are energising; stimulate the nervous system; aid digestion and constipation; ease stress, tension, anxiety, fatigue and depression; and boost the immune system. You might notice the breath can be slightly inhibited in backbends. Although this might feel a bit uncomfortable, rest assured it is very good for your lungs – it cultivates an expansive breath, by stretching and stimulating all the fibres of the respiratory system, and enables you to flood more oxygenated blood into every cell of your body. If you find deepening your breath in breathing exercises challenging, backbends will help to warm up the muscles of the diaphragm and help expand the breath with more ease. 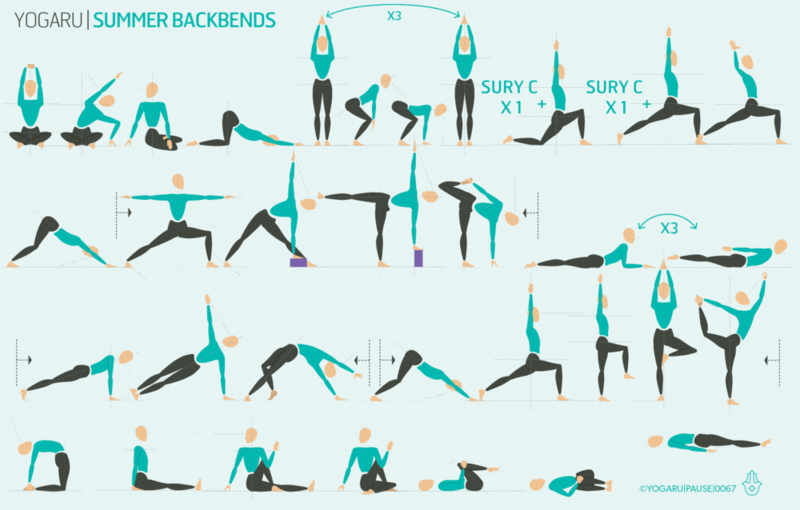 Click this link to get a full list of backbends. This sequence starts with some gentle twists to wake the spine up, and open up the space between the vertebrae. When the vertebrae are compacted together you reach bone to bone sooner, and limit your capacity to backbend. When you find space between the vertebrae, and lengthen up through the spine first, there is more room for the bones to arch into a lovely even curve. To maximise your potential ability to open up in your backbends this sequence has minimal forward folds. When you take your transitional Adho Mukha Svanasana/Downward Dog keep a deep bend in your knees, and look for keeping the natural curve in your lower back. Often when we reach the heel down with straight legs we bring our pelvis into a backwards tilt, which flexes the lumbar spine and flattens out the curve. Similarly keep a deep bend in your knees in Uttanasana/Forward Fold and Ardha Uttanasana/Half Forward Fold. You will bring balance back and neutralise the spine at the end of the sequence with some seated and supine twists. The alignment cues below will give you tips for some of the backbends that you’ll find through the sequence. Remember to lengthen up through the spine first before you come into any of the backbends. In Anjaneyasana/Eight Crescent Moon find your two pointy hip bones and lift them up to lengthen before you arch back into a mini backbend with arms in cactus position. When you are in Ardha Chandrasana Chapasana/Half Moon Sugarcane press your hand into your foot and your foot into your hand. Lengthen through the thigh of your lifted leg and reach your knee up and behind you. Extend through the whole spine and gently arch your head back. For the peak pose Natarajasana/Lord of the Dance spread the sole of your standing foot. Press your lifted foot into your hand and your hand into your foot. Broaden through the collarbones and extend your sternum forward and up. Lift your pointy hip bones up and check that they stay squared to the front of your mat. The hip on the lifted leg side will naturally try to lift up, see can you work towards bringing it level with the other hip. Before you come into Ustrasana/Camel lift your torso out of your pelvis and lengthen up through the spine. Move into the pose by arching through your whole back, starting with your lumbar, all the way to your cervical spine. Lightly draw your navel to your spine to support your back like a girdle, and protect you from going too far into your backbend.